Naturally kind. Keep skin soft, smooth & nourished. Skin-friendly natural extracts. Dermatologically tested. pH-balanced. Free from parabens, mineral oils, petrochemicals, animal extracts. 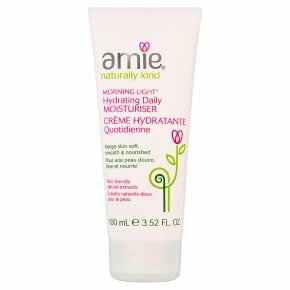 Suitable for vegetarians and vegans.Amie's gentle and effective formulas are your skin's best friend: bursting with high-quality naturally derived plant extracts that work in complete harmony with your skin to help keep it clear, soft and radiant. Morning Light Hydrating Moisturiser is rich in rose extract, rose hip oil and mallow to help keep skin soft, hydrated and nourished all day long. To use: After cleansing, smooth onto skin.